LeBron James posted 24 points, 12 rebounds and 11 assists, his second triple-double of the season, and then sat out the whole fourth quarter as the Lakers lashed the Hornets Saturday. 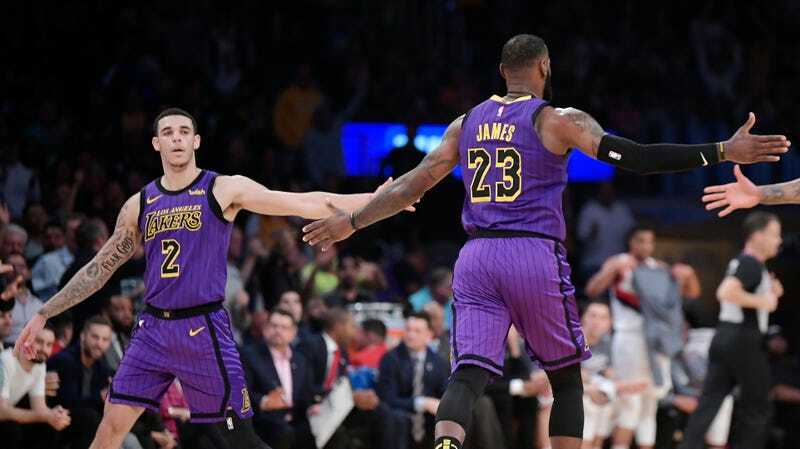 As LeBron headed off the court to rest his bones, he took Lonzo Ball aside and told him to look up: the 21-year-old was just three rebounds and two assists shy of a triple-double. “Go get it,” James told him, via the Los Angeles Times. Then he looked on with glee as Ball fattened his own line to match. If only that last bit were true, Los Angeles would be a more convincing team. Lonzo Ball, still shooting an abominable 39 percent from the floor, doesn’t actually put the ball in the hole all that well. Last night’s Lonzo did, taking it to the rack with bullish vigor, and if the Lakers could regularly expect that from Ball, they’d creep up into the league’s elite offenses. They already get out in transition more than any other team, with Ball and James always happy to huck the ball down the floor to some streaking youth. But the have no identity in the half-court much firmer than merely “having LeBron James.” Since LeBron is able to collapse an entire defense with a few casual dribbles, it’d be a boon to see Lonzo less passive, more prone to punish lazy closeouts and generate an even better look. Having those two passers does open up a lot for the rest of the team. Any credible big will feast; even an under-the-weather JaVale McGee, hooked up to IVs before the game, received nutritious looks and went 9-for-10. With both James and Ball operating in full swing, the Lakers had 32 assists and shot 53 percent from the field, buoyed by a ridiculous 66 points in the paint. James and Ball were +31 and +34, respectively, in this 128-100 deletion of the Hornets. Everybody knows what a LeBron triple-double looks like; this one’s a little more of a novelty. They became the eighth pair of teammates to notch triple-doubles in the same game. It hadn’t been done since Vince Carter and Jason Kidd in April of 2007. Here’s the full list, via NBA.com.